James Allen once said: “The law of harvest is to reap more than you sow. Sow an act, and you reap a habit. Sow a habit and you reap a character. Sow a character and you reap a destiny”. One of the principle we saw at work on earth in the early parts of Genesis is the principles of sowing and reaping which is also known as seedtime and harvest. We live in a world that’s potent and alive. Our very atmosphere is fertile and has been designed to bring forth life. 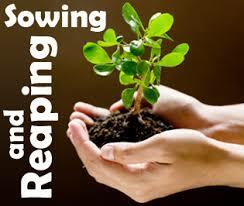 Everything that God has created was created to operate by the principle of sowing and reaping. Every living thing has been created to bring forth seed after its own kind. Some parts of God’s creation have been designed to produce it seed, while others operate as the womb that takes in the seed to bring it to maturity. Adam and Eve were commanded to be fruitful and multiply. They were to do this by the principle of seedtime and harvest. The sperm of the man was to produce the seed, while the womb of the woman was to carry the seed to term. The wheat plant bears the seed and the earth acts as a womb to carry the seed to full term. Your words are seed and your minds or hearts are the wombs that take in the seed and bring forth the harvest. That’s why God has advised that your heart need to be guarded. According to this principle, whatever is sow brings forth more of its kind. God created this principle to multiply the good on the earth, but as a result of the fall of man in Genesis 3, the seed of death was also introduced into the world. Therefore in the world today there are two principles at work, the principle of life, and the principle of death. If the seed you give is good, it would produce for you a harvest of good, and if the seed is bad it would only produce a bad harvest. If you give nothing to work with, it produces nothing. The principle of seedtime and harvest, also known as the principle of sowing and reaping does not discriminate. They would learn to discipline themselves to put it to work to their advantage. Robert Collier said: “You have to sow before you can reap. You have to give before you can get”.This principle of seedtime and harvest would continue to give the activities of this earth, as long as the earth remains. Your life today is an accumulation of the seeds that you sowed yesterday. Harvest day is definitely on its way. The only way to bypass this principle is by engaging the principle of substitution. This principle of seedtime and harvest operates on the spiritual, physical, mental plans, just to mention some but a few. Most of the other spiritual principles of the bible have this law governing the operation. This entry was posted in success and tagged Consistent, Encouragement, Fulfillment, Habit, Imagination, improvement, Increase, Insight, Journey, knowledge, Life, Life changing principles, Passion, Persistence, Principles, Spiritual, success, Successful, Talent, Vision, Wisdom. Thanks so much for your time schedule and kindness to go through my blogs… See you again every Monday morning for another interesting soul uplifting spiritual principles for success…. bye!!! !